I had just typed up a nice long post, and was putting the final touches to it, when LJ ate it! Unfortunately, Restore from Draft only put back my mood, which I ought to now change to 'irked in the extreme', as the good ship 'Cheerful' has definitely sailed. Bad LJ! In a nutshell, then: my contract with my current employers got extended till the end of the year, which in real terms means my future is still somewhat uncertain. Which puts me in a quandary: I like my job, and would like to progress in it, but maybe I should keep my options open and stop saying a polite no to all the agencies and headhunters that have suddenly been able to find their way to my LinkedIn profile with all these wonderful opportunities they want to discuss with me. Strike the iron while it's hot, so to speak, as I'm sure they'll all disappear into the woodwork again the minute Yuletide comes around and -God forbid- the company decides to let me go. I've decided that from now on, I'll forego the 'pleasure' of spending King's Day in Amsterdam; I'm simply getting too old and too cranky to see the appeal in a day spent jostling and being jostled by the crowds, tripping over full and empty beer cans, tons of litter, drunken students and after queueing for half an hour in McD's, discovering that a trip to the ladies' will suddenly set you back a staggering €2. Home of the Whopper, indeed. I would totally go to Iceland, but I doubt I could afford it this year. Float in hot springs? Drive jeeps with almost flat tyres across glaciers? I'm sure I saw a TV programme about this once and it looked to be rather fun! Could well have been - it was a few years ago and I remember lots of whooping Icelanders doing something to the tyres which may, or may not, have involve the use of a lighter! Well I guess being employed till Christmas is a good start... but I think you're right to follow up some of the offers if they would come with a longer contract. I think I've had my share of being unemployed; I don't ever want to have to go through that again! I'm glad that your contract got renewed! That has to feel good. But on the other hand, it never hurts to keep your options open. Nothing wrong with talking to recruiters and seeing what's out there. Obviously, I'm glad my contract got renewed; I just wish they could have been more generous, as 6 months is no time at all and I know I've got at least another year's worth of work to do if I'm to complete my task, but...yeah. I definitely think that you should allow yourself to be courted for other positions. Ones that are permanent. Govt would be even better, because a govt job is usually for life. (I say usually because very so often here, a right wing govt decides the public service is bloated, cuts it, then complains about poor services or lack of oversight). 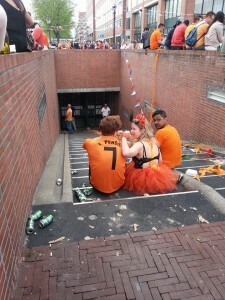 ETA: Surely there are King's Day celebrations in The Hague, you don't have to go all the way to Amsterdam? Also: 2 euro for a pee?? WTFF?? Certainly there are King's Day celebrations in The Hague as well, and quite good ones too...I've just been participating in the Amsterdam ones since my student days. And it's about time I stopped. If by govt job you mean join the Civil Service, rather then become an undersecretary of some sort, I'm afraid my chances of getting in are extremely slim. The service has been cut, cut, and cut again, with more cuts on the way, for the last 7 years or so. And besides, I haven't the mindset.